Since our tutorial link magically disappeared from the header, I have decided to move these tutorials to its own subforum. This tutorial is on basic board posting, put together by our lovely moderator, Nicole. Here is some help for anyone having trouble with the functions of the board. 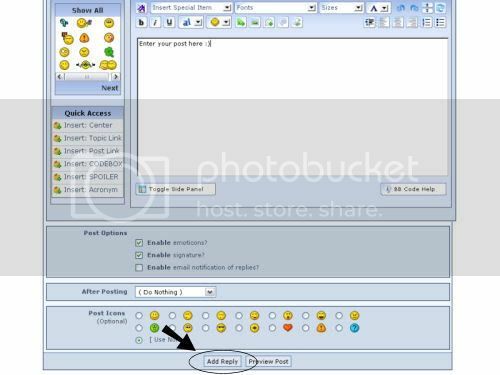 First, you will find a tutorial for basic posting and messaging, then an explanation of some of the boards other functions. Hope this helps! 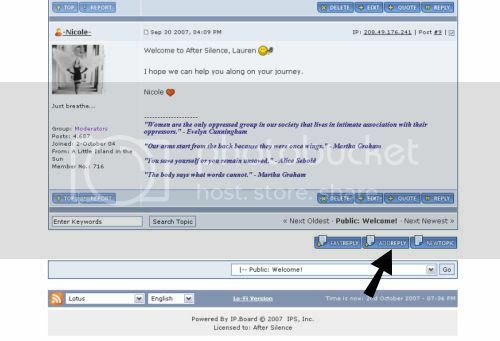 Enter your reply in the text area and when finished click the add reply button as indicated below. Editing your own posts: You may edit your own posts if you make mistakes or typos, with the edit button as below and you can choose the full edit screen or a quick edit pop-up screen. Fast Reply Button: This opens up a little form below the topic where you can reply quickly without being taken to another page.